A DRUG driver from Harrogate will spend Christmas in prison after he was caught by North Yorkshire Police police twice in one week. Oliver Rutter, 28, has been jailed for 10 weeks after being convicted of a string of motoring offences. Rutter, of Grantley Drive, Harrogate was charged with drug driving and driving without insurance and a licence after he was stopped at the wheel of a Ford Fiesta on August 21. On August 28, Rutter was charged with the same offences after the same officer spotted him driving the Fiesta. Blood tests following the first stop showed Rutter had taken cannabis and cocaine. He tested positive for cannabis following the second stop. He was due in court for a trial on December 10, but failed to turn up. Officers had to search for him after he failed to attend court but Rutter eventually handed himself in at a police station two days later. He was remanded in custody by York Magistrates’ Court on Thursday (Dec 13) after pleading guilty to drug driving and having no licence or insurance. Magistrates said his driving presented a “severe risk to the public” and said they had no option but to send him to prison for 10 weeks. He was banned from driving for 18 months. Rutter was also subject to a community order for failing to stop for police and drug offences. After the hearing, Harrogate-based PC Adam Smith who made the arrests said: “I first encountered Rutter on Christmas Day 2017 when I dealt with him for other driving offences. “A year later due to his persistent offending and a proactive approach by police, he will now be spending this Christmas behind bars. 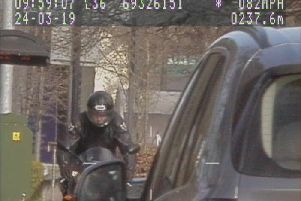 “He continued to be a menace on the road and put innocent motorists at risk since then, and has been caught committing various offences – and at one point even failed to stop for police, putting further lives at risk.